Gadgets and geeks galore at the IT Show! I recently visited the IT Show at Singapore's Suntec City (also known as our very own vertical Silicon Valley) to see if I could pick up a good bargain or two. 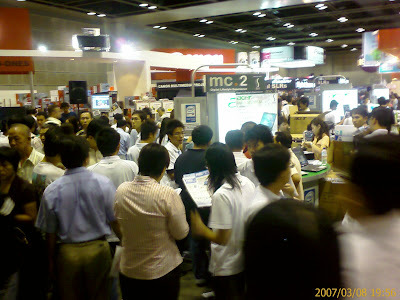 It always amazes me how these computer fairs and exhibitions could attract such huge and massive crowds, all thronging the place to catch a piece of the retail action. The number of people streaming in and out are usually non-stop. More importantly, most who leave are seen happily carrying bags and even trolleys full of hardware, software and all manner of computer peripherals and accessories. Why have these shows become such huge consumer successes? More interestingly, why are some other consumer fairs (like gifts, furniture, weddings, and health) relatively moribund while PC shows continue to draw the crowds? First of course is the fact that such shows usually offer fabulous prices. Everybody loves a good bargain, and you can get lots of them here. What's especially prevalent are bundled packages where the deal is sweetened with one freebie thrown in after another plus a good cash discount to boot. Next is the publicity and advertising that such shows carry. With extensive coverage in Digital Life (a companion magazine to The Straits Times, Singapore's largest circulating newspaper), full coverage at Hardware Zone and other geek hangouts, everybody's bound to hear about them. Of course, you should also count in the Word Of Mouth effect that such shows generate, especially if there are breakthrough products. These events have also evolved into technology showcases. It has become a computer circus of sorts, where the latest and greatest consumer IT products are rolled out by loud and aggressive promoters, extolling the virtues of their latest widgets at the top of their voices. An example would be Singtel offering its latest broadband access package at a blazing speed of 10Mbps which comes with a free notebook. Another such deal - one which I personally succumbed to - was an external hard disk drive that offers one-touch backup which covers Operating System. Finally, I believe that Singapore is truly becoming a nation of geeks. Infocomm consumption figures by agencies like the Infocomm Development Authority of Singapore show that we have one of the world's highest Internet penetration rate. Practically every Singaporean from kids to grandparents carry mobile phones (sometimes a few each), while more are blogging, IM-ing, and chatting each day. For me, I was one happy customer that evening, bringing home a brand new wireless modem and router, wireless USB network adapter, colour printer catridges, an external HDD, and an optical mouse. Any other thoughts on this from my fellow gadget freaks?